Elizabeth Mumaugh asked for a divorce from her husband, Lopez some time ago and the case was heard by Judge Harper last week. 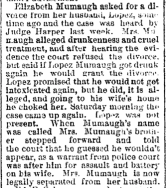 Mrs. Mumaugh alleged drunkenness and cruel treatment, and after hearing the evidence the court refused the divorce, but said if Lopez Mumaugh got drunk again he would grant the divorce. Lopez promised that he would not get intoxicated again, but he did, it is alleged, and going to his wife’s home he choked her. Saturday morning the case came up again. Lopez was not present. When Mumaugh’s name was called Mrs. Mumaugh’s brother stepped forward and told the court that he guessed he wouldn’t appear, as a warrant from police court was after him for assault and battery on his wife. Mrs. Mumaugh is now legally separated from her husband.